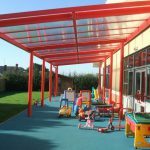 Here at Twinfix we stock and use Makrolon polycarbonate. This is a high quality, optically clear extruded glazing sheet manufactured in clean-room conditions by Covestro AG, a subsidiary of Bayer AG, in Germany. 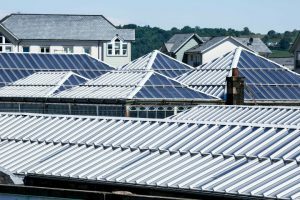 As with all of our product range, we aim to use and offer the finest polycarbonate available in the marketplace. 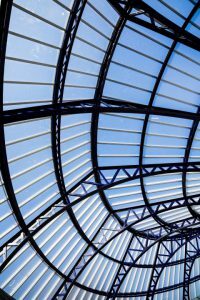 We stock a wide selection of Makrolon polycarbonate in our Warrington premises, in different grades, structures, thicknesses, lengths and tints so that we and our customers can select the most suitable product for any particular application. 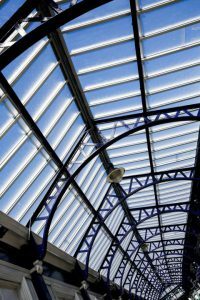 Solid polycarbonate has traditionally been used for both vertical and overhead glazing applications while the multiwall versions act like double glazing, retaining heat inside buildings. 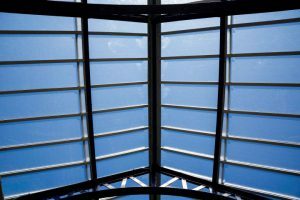 These make great rooflight products. 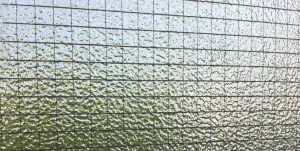 There are privacy grades for use where light, but not visibility is required, and we also offer GW Polycarbonate, a 6mm stippled-surface, solid polycarbonate that mimics traditional Georgian wired glass and is ideal for use in Heritage buildings. 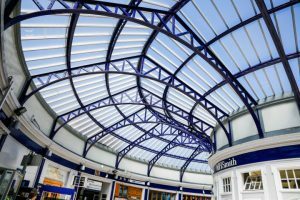 Polycarbonate is virtually unbreakable, being over 200 times stronger than the same thickness of glass! It is so tough that you are unlikely to ever have a breakage failure, either while installing it or in use. 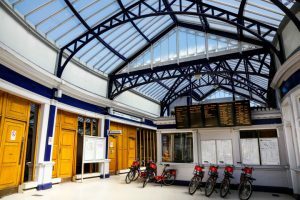 So, no more annual maintenance bills for regular replacement of cracked and failed glazing. Fit polycarbonate once and then forget about it. 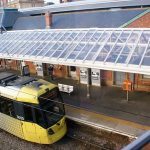 Polycarbonate’s light weight (less than half the weight of the same thickness of glass) produces many benefits during installation, use and transportation to and around sites. 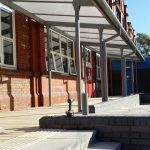 It can be fitted using aluminium structures and frames, rather than steel ones. 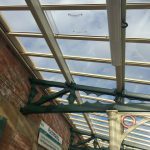 Being able to replace the heavy steel frames that were required for glass with lighter aluminium frames can help to extend the life of an older building. And being non-rusting, the aluminium will keep its good looks into the future. 25mm multiwall polycarbonate weighs only 3.4Kg/m². Compare this with double-glazed glass that weighs around 30Kg/m² and it is easy to see why this sustainable product is often specified for overhead glazing in both new-build and refurbishment projects. 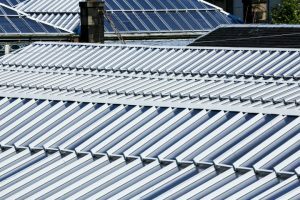 Polycarbonate’s light weight also results in fewer costs when physically moving polycarbonate around the country and around building sites. 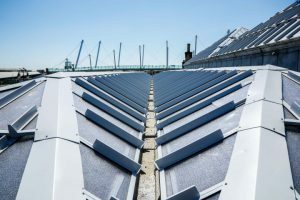 At the end of its long life span polycarbonate may be recycled, along with the aluminium fixings used for its installation. 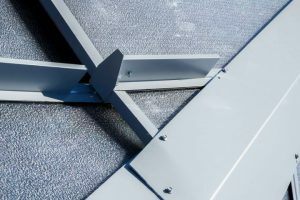 If you combine these product benefits with the ground-breaking selection of aluminium fixing systems and installation accessories that we offer, it is understandable that polycarbonate, in both its solid and multiwall forms, continues to be a regularly specified product in today’s modern building and construction world. 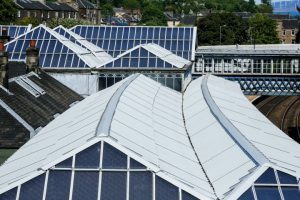 Watch this space for future innovations in polycarbonate glazing and installation! 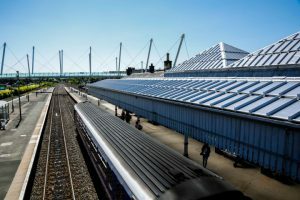 We have just launched a new Data Sheet featuring our 6mm solid Georgian Wired (GW) Polycarbonate. 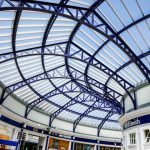 This stippled surface polycarbonate glazing mimics traditional Georgian wired glass and provides specifiers, installers and users with all the modern-day, safety benefits of glazing with polycarbonate in heritage buildings. 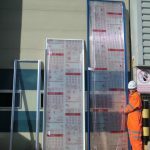 So, if you have problems with failed Georgian wired glass but your building needs to retain its conventional look, then this is the product for you. Download the Data Sheet. There’s something that feels just that little bit naughty about eating lots of cake during your morning work coffee break! 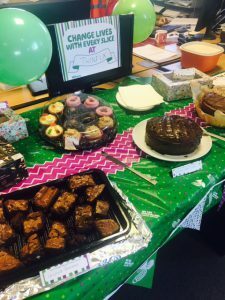 But, when it’s in the name of MacMillan you soon forget such feelings and put your hand in your pocket for this great cause. 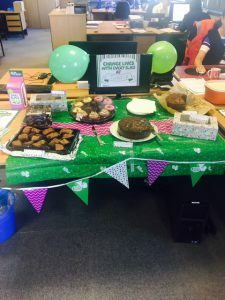 Our team certainly did that the day we held our official MacMillan Coffee Morning. Everyone entered into the spirit of things, baking or buying cakes and then tucking into them with great gusto. Di Forster, the winner of the ‘Guess the number of spots’ (there were 495), also donated her prize money back into the pot and the final total raised on the day was over £400. 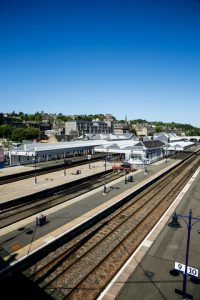 Well done everyone – a great team effort with a really great result! 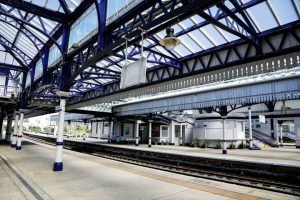 We are very proud of our work at Stirling station that saw the original glass roof glazing being replaced with our Multi-Link-Panel Non-Fragile glazed with Georgian wired effect polycarbonate. 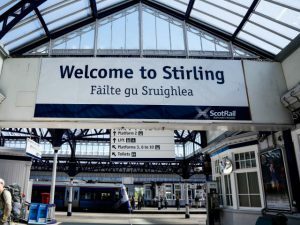 We worked with Story Contracting to replace some 2,800 square metres of failed Georgian wired glass in the many complicated overhead canopies at Stirling Station. 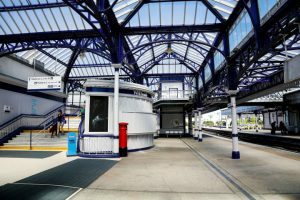 The roof looks fantastic and still looks in keeping with the station but as the Georgian wired polycarbonate is virtually unbreakable it will stand the test of time. 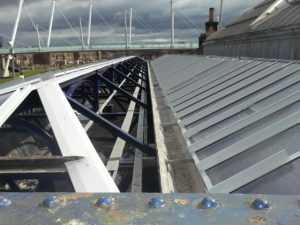 The Framing system for the Georgian wired effect polycarbonate was our Multi-Link-Panel NF which is classified as Non-Fragile to the ACR[M]001:2014 Drop Test for Roofing Assemblies. 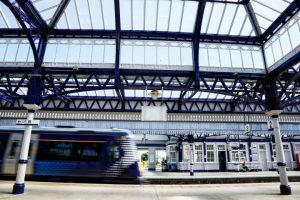 Also fitted into our glazing panel were 174 Twinfix Access Panels that enable personnel to undertake maintenance work to be carried out by personnel working safely from below, rather than above, the glazing. 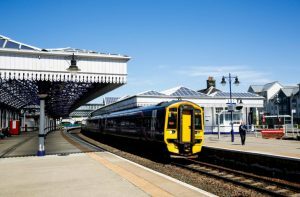 These panels were developed by Twinfix at the specific request of Network Rail and are proving to be very popular in station refurbishment projects. 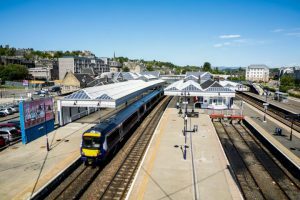 We are proud to have worked with Story Contracting on this traditional station which now looks as good as new again and ready for another busy 100 years!